Experts from the offshore energy industry around the world came together May 4 to 7 for the 2015 Offshore Technology Conference (OTC) at NRG Park in Houston. More than 94,700 attendees from 130 countries gathered at the annual conference, demonstrating OTC’s position as the leading forum to exchange ideas and opinions to advance scientific and technical knowledge for the safe, environmentally friendly and sustainable development of offshore oil and gas resources. It is the sixth largest attendance in the 47-year history of OTC. The sold-out exhibition was the largest in show history at 695,005 ft², including outdoor exhibits, up from 680,025 ft² in 2014. This year’s conference also had 2,682 companies exhibiting, up from 2,568 in 2014, representing 37 countries. International companies made up 42 percent of exhibitors. “OTC continues to bring the world to Houston. The record-setting number of paper submissions ensured a high-quality technical program, covering the latest innovations and applications. Coupled with superb panels, in-depth executive keynotes, a new crop of Spotlight on New Technology award winners and a record-setting exhibition, OTC drew everyone from CEOs to engineers to government officials,” said Ed Stokes, chairman of OTC. This year’s event featured 11 panel sessions, 29 executive keynote presentations at luncheons and breakfasts, and nearly 300 technical paper presentations. Speakers—including major, independent and national oil companies; federal and regional government officials; and academics—presented their views on a wide variety of topics, including future industry directions, operational integrity and risk management. 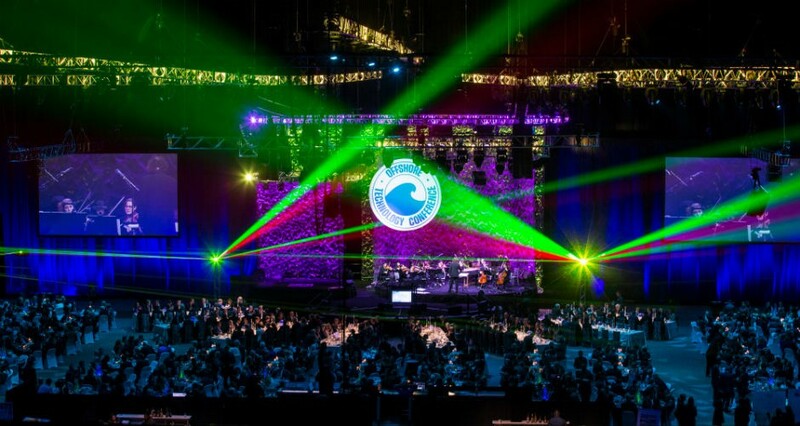 OTC’s Spotlight on New Technology Awards recognized 17 technologies for their innovation in allowing the industry to produce offshore resources, including two companies in the new category of Small Business Awards. The conference’s focus on bridging technology was exemplified by the “Pumps and Pipes: Innovation in the Oil Field and Cardiovascular Medicine” technical session. Leaders from two of Houston's major industries—medicine and oil and gas—discussed advances which could be shared to add value, reduce risk and improve efficiencies. Safety also continued to be a key area of focus at OTC. The Bureau of Safety and Environmental Enforcement (BSEE) announced the launch of the SafeOCS program, an initiative aimed at collecting and analyzing “near miss” data to learn more about potential problems offshore and prevent them from becoming an issue. In addition, BSEE released its first-ever Annual Report, which presented the agency’s analysis of offshore activities and revealed an encouraging decline in incidents since the organization was created in 2011. The Center for Offshore Safety hosted a breakfast session focused on “Improving Safety and Environmental Performance.” In addition, a technical session and lunch discussed ways to improve the effectiveness of safety and environmental management systems. Additional highlights included discussions about the continued importance of deepwater exploration and the next emerging offshore plays. A panel session from the International Oil and Gas Producers shared thoughts about the need to simplify and standardize specifications to drive down costs and quicken the development of new projects as well as further improve safety. The Pioneers of OTC Luncheon celebrated the long history and success of the conference and paid homage to the volunteers who have given their time and hard work throughout the years to make the conference what it is today. OTC’s Energy Education Institute was attended by 200-plus Houston-area classroom teachers and 200-plus students. Teachers learned about scientific concepts of energy and its importance in a fun and informative way. Participating students saw firsthand the exciting opportunities the energy industry can offer. Individuals seeking career advice or new opportunities were invited to participate in OTC’s Open Access Day, which provided free registration to 1,300 attendees seeking to tap into the conference’s networking opportunities. As part of the day’s programming, attendees learned how to build valuable relationships and sharpen their skills through two professional development sessions. OTC also hosted The Rice Alliance Startup Roundup. At the new event, 50 emerging companies had the opportunity to meet one-on-one with investors. It offered a great opportunity for OTC attendees to learn more about these startups and enable potential partnerships and investments. The Next Wave, OTC’s program for young professionals, was attended by nearly 500 people and focused on how to face the challenges ahead for young professionals while recognizing the increased interconnectivity of our global industry. The fifth Annual OTC Dinner raised USD 250,000 for the Independent Petroleum Association of America (IPAA) and the Petroleum Equipment & Services Association (PESA) Energy Education Center for the benefit of the Energy Institute High School. During the dinner, OTC presented its 2015 Distinguished Achievement Award to Elmer Peter Danenberger for his significant contributions to offshore safety and environmental protection. The Distinguished Achievement Award for Companies, Organizations and Institutions was presented to Petrobras for its pre-salt development; while Ray Ayers, PhD, PE was honored with the OTC Heritage Award in recognition of his 50+ years in offshore research and development. OTC 2016 takes place 2–5 May 2016 at NRG Park.